Alright, i hate that i see nothing going down.. i feel like everyone is fckin sittin on there a$$ doing nothing.. so im put some Basic challenges up.. Challenge 1 : Most Close Grip Pull-ups because this is the barbarian forum we do this in L-seat. remember FULL LOCK OUTS, CHIN ABOVE THE BAR.. Challenge 3 : Most Dips.. oh but in every lock out u have to in an l-seat hold it for 1 seconds thats 1 rep . yes i know that this challenge is up already, but we need to let them know .. that barbarians dont sleep.. u know how this one goes. FULL LOCK OUT AND BREAK THE L.. Challenge 4 : Most Hanging Leg-raises, toes to bar and back down.. Challenge 5 : Most Dragonflags .. all the way up and all the way down. challenge 6 : is the Most reps one here is a video of my lil bro - an warrior..
Zef,Rick - i whant that u post a challenge video to ..
.. BECAUSE THIS AN BAR-BARIAN FORUM.. EVERYONE CAN POST CHALLENGES, PM THEM TO ME AND I CAN JUDGE ..
great challenges Metin !! i definetly will workin on it!! until march 30th i put videos of challenges as a symbol of my participation with this forum and with BAR-BARIANS !!! Will see a lot of good vids!!! I'm in! Especially the close grip l-seat pull-up challenge! I suggest Human Flag challenge. Rise your straight body full up and down (straight legs together). Full up and down means you have l-seat hold at the highest and lowest position without touching the floor! It would be nice motivation to complete all this Challenges if you set number of points for each exercise depending on the complexity and then calculate the sum for everyone(consists of all challenge points) and make a table of results. So do the average rating table. Maybe it's complicated, but What do you think? That's a really good idea Alexander, that way scores can be averaged out so people don't win based solely off their strong points. I'm going to do them all, f**k it let's get it on! x2 F**k it, I'm in for all challenges, too. Metin if you dont mind I'd also suggest to put it to the higher level. And I could help with it. I would suggest to make 2 marks for each challenge. One for quantity, the second for quality. Then make an average from those 2 marks. And then an average mark from all the 6 challenges. I think this would be really fair. So the organizer could make a thread in the forum where everyone who wants to participate could sign up. After a couple of days he makes a table in Excel with the list of participants vertically and challenges horizontally. Under each challenge there must be 3 columns for 3 marks (quantity, quality, average). Then he share this table so that everyone could download it. It would be something like "tournament table". Then we post our vids and Commission (you and somebody else from Bar-barians) evaluates them. Everyone creates his own thread in this section of the forum for his vids. But I think that all the challenges must be the same for everybody. Why to devide HSPU's from hs wall pu's? If so I can also ask to devide pullups to simple ones and to OAPs and to count 1 OAP for 7 simple ones..... So there must be exercises that the most forum members can do. May be it's too complicated.. but it would be really interesting for everybody. I'm in too! Can i post several vids? Or have all challenges to be in one big video? sorry metin,but i'm doing all in one session and posting in one vid,except for Challenge 6, gonna do that one fresh. Just doing 1 challenge isn't the Bar-barian way, you gotta bust your gut and see what u are capable of, and really these challenges just look like a routine you would post and do every 2nd day. Looks wicked. nice work mate getting everyone motivated. i only seen this post today and am amped to see what everyone else will be posting. Yeah I was thinking about mixing them all together as well. I'm in for the HSPU challenge. 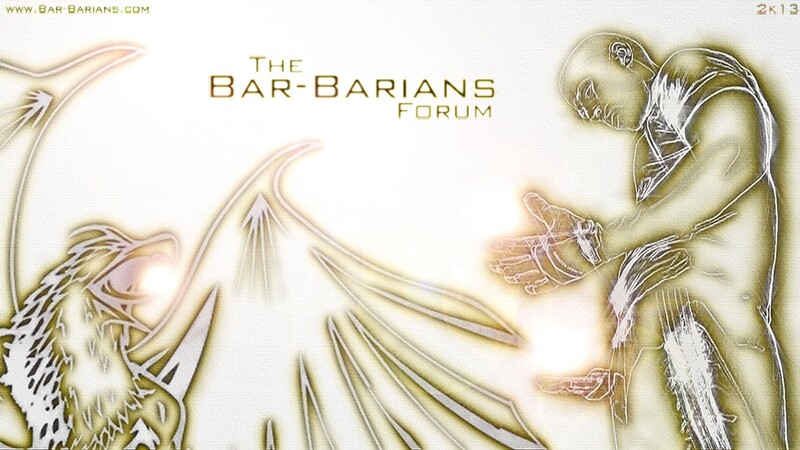 Subject: Re: Bar-Barian Forum Challenges.